According to the National Oceanic and Atmospheric Administration (NOAA), 2010 recently earned the distinction of having the hottest combined global land and ocean temperatures for the first half of the year since record keeping began in 1880. In New York City, where VisionArc’s office is based, the 2010 summer is finishing up as one of the hottest on record. New York is part of a region that encompasses some of the most expensive electricity markets in the country, where rates can be 45% higher than other areas. In July, the region actually came within a degree or two of its all-time electricity demand record. For many in cities like New York, the indications of a warming planet have (so far) played out as unrelenting heat waves. The weather challenge has appeared to be a technical one: how to maximize the efficiency, reduce the cost and prolong the life of the things that keep us cool, fed and mobile? 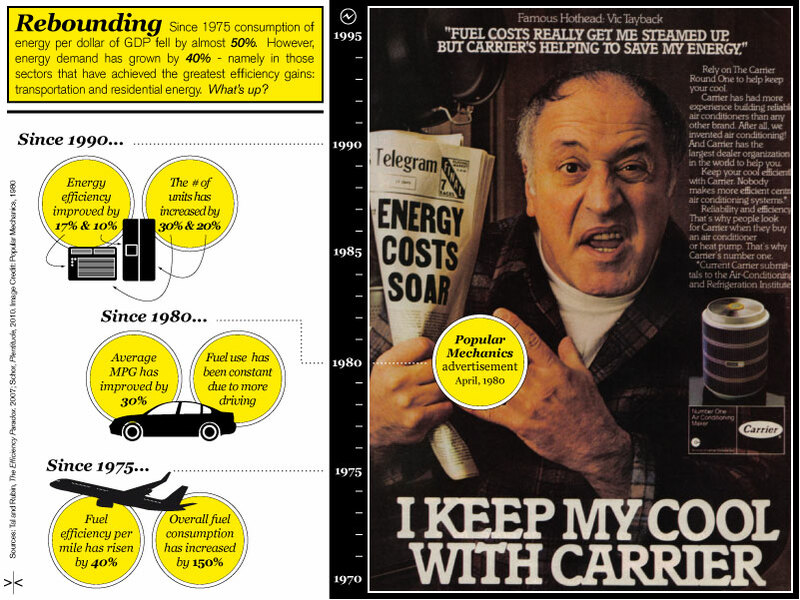 Since 1975 the United States has made leaps and bounds in improving its overall energy efficiency. In fact the energy used per dollar of GDP has been cut by 50%. Paradoxically however, in that time we’ve actually increased our energy demand by 40%- namely in those sectors that have achieved the greatest efficiency gains: transportation and residential energy. In the mid-nineteenth century a British economist named William Stanley Jevons named this paradox the ‘rebound effect’ after he observed what appeared to be a substantial increase in the amount of coal England was consuming despite vast efficiency gains achieved by the advent of James Watt’s steam engine. He argued that these efficiency improvements in the way coal was consumed would actually increase the demand for coal rather than slow the pace at which England was rapidly depleting its coal reserves. In 1980 two more economists named Daniel Khazzoom and Leonard Brookes used this paradox to examine a similar trend that had emerged after the OPEC crisis of 1973 and 1979. Like Jevons, what they observed was that when the demand for higher automobile fuel-efficiency ratings began to rise, overall consumption of fuel followed. Their analysis of Jevons’ work was later dubbed the Khazzoom-Brookes hypothesis in 1992. The direct and indirect dynamics of the rebound effect are also described in the recent book Plenitude by former Harvard School of Economics professor and sociologist, Juliette Schor. In the book she defines the direct dynamics as ‘substitution’ and ‘income’ effects. The substitution effect is the tendency to buy more of something when it is cheaper whereas the income effect concerns the spurred consumption of something because its low cost effectively raises the consumer’s real income. A higher perceived income leads to higher perceived purchasing power and even greater demand for more goods and services. The indirect effects, however, represent a more complex and potentially larger cause for concern. As Jevons saw in the 19th century, efficiency gains not only encouraged greater consumption but also the scale of production itself. With energy as a crucial input to vast numbers of other goods and services, increasing its efficiency would thus boost the consumption of other goods, fueling the broader economy and eventually leading to higher overall energy use. The quantification of these dynamics varies across different sectors and countries. In the U.S. about 30% of efficiency gains are canceled out by higher demand and consumption. In automobiles, the range is somewhere between 10 and 23%. The rebound effect is therefore useful because it questions the primacy of engineering solutions in what increasingly seems like questions over regulating economics and understanding behavioral dynamics. Reducing fossil fuel consumption and carbon emissions will require an earnest embrace of all solutions- technological, economic and behavioral. Increasing fuel, appliance and construction standards and a new generation of hybrid and electric vehicles will have to thus form a diplomatic partnership between clean technologies and fossil fuels to fill in the gaps along the way. A few bright spots on the Green economy radar have appeared over the summer and in recent months. The nation’s first offshore wind farm development off the coast of Cape Cod was approved in April and the largest solar power development in the nation is currently nearing federal approval. Yet promising as these developments might be, renewable energy still remains prohibitively high and poses a basic economic hurdle in front of any immediate advances. Electricity in Massachusetts, where the Cape Wind project is planned to be built, currently sells for around 9 cents per kilowatt hour. The offshore brand would start at 20.7. A similar project in nearby Rhode Island was voted down by the Public Utilities Commission based on similar concerns over the proposed 24.4 cent a kilowatt-hour price tag. Retail rates in Rhode Island now run around 13 cents per kilowatt-hour. These challenges are unfolding in the broader context of continued stalling over how the United States plans on legislating its position on the broader question of climate and energy policy. In July Democrats in the Senate decided that they would hold off in their efforts to get a climate bill approved. Elsewhere, countries such as Canada, Australia, Japan and other European nations continue to prioritize near-term concerns amidst the lingering global financial crisis, pushing climate issues further to the rear. This context illustrates once again the notorious difficulty that humans have at addressing problems that unfold incrementally. Add to this the difficulty of getting most of us to agree on paying more for a lifestyle that is still widely viewed by critics of the green energy transition as compromised and the gridlock seems altogether predictable. Ironically though, keeping the cost of energy high is also viewed as crucial to avoiding the counterproductive effects of rebound. While new, cleaner and more efficient technologies have been vaunted as among the most effective ways to reduce our dependence on fossil fuels, the rebound effect highlights other, perhaps less obvious concerns. If we manage to make this transition and resolve our emissions problem, the economic growth associated with these new technologies may in fact encourage even greater demand for more resources such as rare earth minerals for turbine manufacture or sprawling land acquisition for biofuel production. The possibility of a rebound effect suggests that in the process of transitioning to a new energy future we will not only have a technological challenge but the vast scales of macroeconomic and consumer behavior to contend with also. This will require identifying connections between efficiency and demand as well as the overall pace of growth- all of which play a role in ecological degradation. Perhaps this will give us something to ponder the next time we find ourselves switching on the AC thanks to (another) sweltering afternoon in August. Fall will come with extra welcome this year.